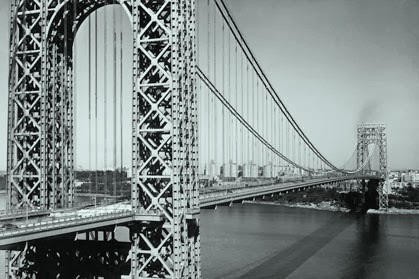 The George Washington Bridge, which connects New York and New Jersey. We are a proud people, Irish Americans, and for good reason. Our ancestors built this nation’s railroads, they worked the mines, they dug for gold and silver, they fought in the wars that came along and they built – and they still build – our cities. Irish Americans were central to the creation of the nation’s infrastructure, and in the process they were co-authors of the American Century too. They were not, and we are not, a petty people. We owe it to them to ensure the great work they started moves forward. So how then to explain where we are? The national spend on our infrastructure, our bridges, road and tunnels, is now at its lowest level since World War II. Levees fail, leading to catastrophic loss of life, bridges collapse into the rushing rivers as commuters cross them, blackouts leave millions without power, subways are dangerously overcrowded, steam pipes explode, dams burst. You can tell a lot about the state of a country by its infrastructure. What story is ours telling us? Our infrastructure is not only beginning to erode. We’re three counties past that. It’s decaying. The American Society of Civil Engineers has recently given America’s infrastructure an overall grade of D. Does that sound like we’re making the grade? And it seems completely incredible to say this in 2013, but a heavy rain shower can bring New York’s subways to a total standstill. Close to half the people in this country no longer have access to a bus or train route. One in four bridges is threatening to collapse. The reason for all this erosion is that it’s estimated we’re spending only 40 percent of the amount we actually need to invest for the upkeep of our infrastructure. Nationally we’re even scrimping on research and development as our utility companies focus on short-term goals. The biggest challenge to the future functioning of our bridges, roads, railroads and tunnels is political, of course. In the recent past, the Republican Party has openly admitted that our infrastructure is eroding, but in their opposition to any economic stimulus and anything President Obama offers — even if it means shutting down the government at the cost of billions to the nation’s economy — they have left themselves no option but to ignore the nation’s infrastructure and jobs crises in the hope they’ll make political hay from the stalemate. There was a time when both parties worked together for the good of the nation. That time has passed. Now, thanks to the four-alarm freak out that is Fox News and the conservative entertainment complex of Hannity, Limbaugh and Beck, compromises are seen as apostasy, and conservative politicians who make them can’t be assured of their reelection chances. While our GOP representatives are busy playing an ideological game of chicken with the nation’s future, other nations have taken note. It’s too early to call this another American Century, but from outside our borders it looks more like the American Crackup. Tourists flying into our country last month were shocked to find the U.S. government shutdown closed all but a few passport control stations here. The result was massive lines, cranky passengers and a serious blow to the nation’s prestige. But if you think, considering all that, there will be a 'come to Jesus' moment in the GOP anytime soon, just take another look at who is setting its agenda. Senator Ted Cruz is the new darling of the far right. Where the rest of the world sees national dysfunction, he sees opportunities for his own party. For a long time now America seems to have been in the process of deciding which issue is more important to it, political purity or political progress. Ultimately I don’t think Cruz has a particularly bright political future to look forward to, but satisfying as that thought is, I’d rather the nation prosper than he fail. How can America project its authority, how can it maintain its global leadership role, when snake-oil senators like Cruz scoff at international relations as though they were of no consequence to the nation's future? Asia in particular is showing growing doubts about the health of our government and our economy, and is beginning to question if we will remain within the top rank globally. To the outside world government shutdown isn't just a political power play, it's a white flag. The GOP used to know this. Fifteen years ago questions about the nation's global status would have been considered absurd. But after two epic wars and an epic tax cut for the richest Americans, which still have to be paid for, we are where we are now. It’s been a while now since an Irish American political dynasty took the national stage to fight for the nation and the little guy who built it, but if ever there were a time to find successors to the Kennedy's it’s now. Our Irish American ancestors worked all their lives to hand us all a better future. We cannot meet their challenge with a shrug.